Configure external site as content sources in sharepoint search – Share SharePoint Points ! In my previous post(Creating and configuring Search service application) I explained how to configure the search service application and its configuration. We can also search the external sites content using the SharePoint search just by creating new content source. Follow the given steps to create the new content source for external site. Verify that the user account that is performing this procedure is a service application administrator for the Search service application. On the Home page of the SharePoint Central Administration Web site, in the Application Management section, click Manage service applications. On the Manage Service Applications page, click Search Service Application. 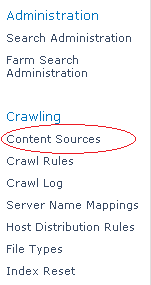 On the Search Administration Page, in the Crawling section, click Content Sources. After clicking on the link you will be redirected to the page where all the available content sources are displayed. On the Manage Content Sources page, click New Content Source. On the Add Content Source page, in the Name section, in the Name box, type a name for the new content source as “External Sites”. In the Content Source Type section, select the “Web Sites”. 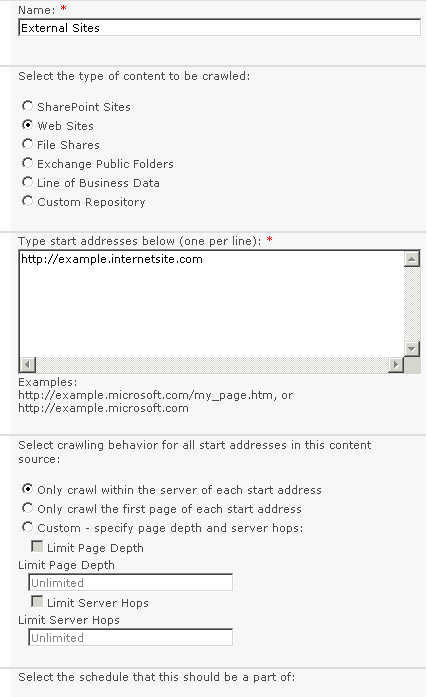 In the Crawl Settings section, select “Only crawl within the server of each start address”. In the Crawl Schedules section, to specify a schedule for full crawls, select a defined schedule from the Full Crawl list. A full crawl crawls all content that is specified by the content source, regardless of whether the content has changed. To define a full crawl schedule, click Create schedule. To specify a schedule for incremental crawls, select a defined schedule from the Incremental Crawl list. An incremental crawl crawls content that is specified by the content source that has changed since the last crawl. To define a schedule, click Create schedule.You can change a defined schedule by clicking Edit schedule. To prioritize this content source, in the Content Source Priority section, on the Priority list, select Normal or High. To immediately begin a full crawl, in the Start Full Crawl section, select the Start full crawl of this content source check box, and then click OK. This finishes creation of the new content source for external sites. But not all the internet facing sites allows anonymous access to its content. So there must be some place where we can configure the rules for the Urls which allows us to enter the credentials to access the content of site while crowing. So navigate to Search Service Application > Crawl rules. Path: Mention the internet site Url under the path section. 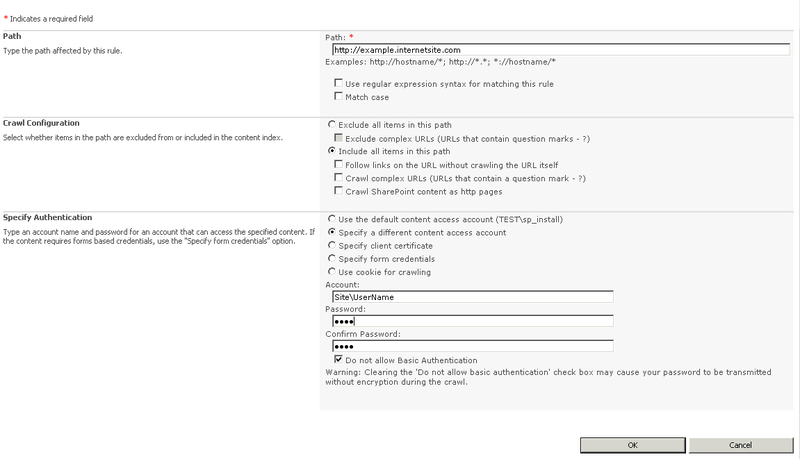 Crawl configuration: Select the “Include all items in this path” option. Specify Authentication: Select “Specify a different content access account”. Enter the site credentials. Next and last step is to crawl the content source “External Sites”. This will allow SharePoint can crawl the external site content. I did the above setup for my external sites, I see logs that if did the Crawls. When I do find, it doesn’t return results. Any suggestions on it. visiting thios web page and be սpdated with the hottest gossіp posted here. Stay up the good work! You realize, lots of people are searching round for this information, you could help them greatly. I’m doing this for multiple sites, any idea how I can create a refiner that I can use to select by site. i.e. crawling news. ***, calendar. ***, and www. *** Only www is a sharepoint site. Hi, what would happen to dynamic content of the site? e.g. there is a page in external site, which fetch data on-load from SQL. Thanks for referring my post. In case you have dynamic content of the site, it must be part of the next full/incremental crawl. It does not matters if you are fetching data from SQL on load or from any service. SharePoint will only have reference of all the pages exist on the external website. Hope that answer your question. understanding anything entirely, however this piece of writing presents nice understanding even. In fact when someone doesn’t understand after that its up to other users that they will help, so here it occurs.